You shall not modify, copy, distribute, transmit, display, perform, reproduce, publish, republish, license, create derivative works from, transfer, sell, rent or lease any information obtained from the IHDA.org site. HOURS: 8:30 a.m. – 5:00 p.m. 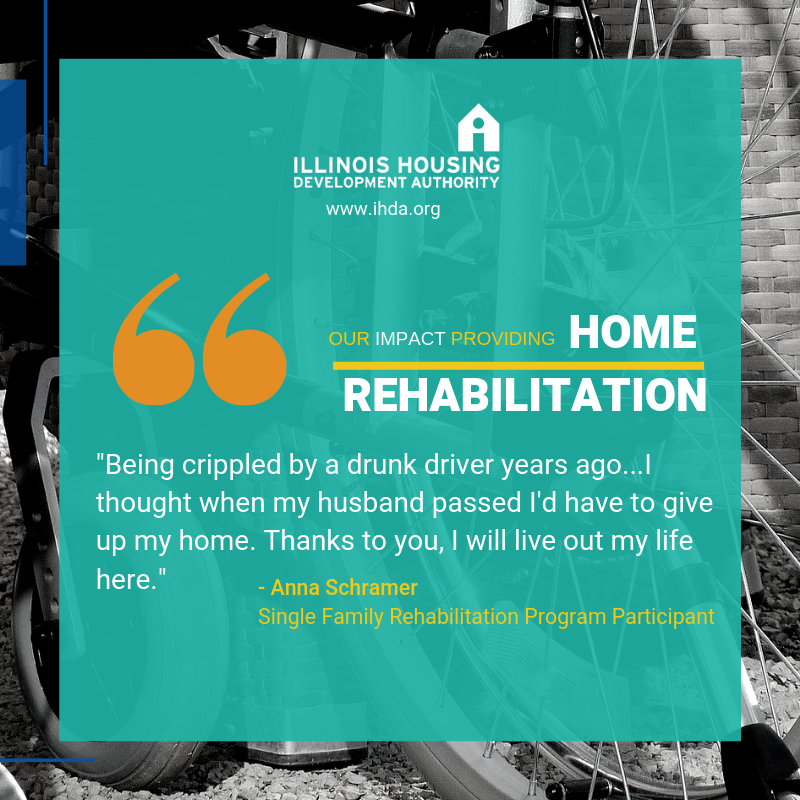 When homeowners share their experience of receiving funds from IHDA's Single Family Rehabilitation (SFR) Program to help make necessary home repairs, it speaks volumes and hopefully inspires others in need to take action. It can be a stressful time when costly home repairs are needed, but with help from IHDA’s Single Family Rehabilitation (SFR) Program, homeowners are finding the help they need to make their homes more comfortable, safe and energy-efficient. When homeowners like Anna Schramer of Courland, IL share their experience of receiving funds from the SFR Program to help make necessary home repairs, it speaks volumes and hopefully inspires others in need to take action. SFR was created to assist income eligible Illinois homeowners with critical home repairs. Funding for SFR is available through 21 municipalities and nonprofit organizations. For more information, please visit our website - www.ihda.org/my-community/revitalization-programs. © IHDA. ALL RIGHTS RESERVED.